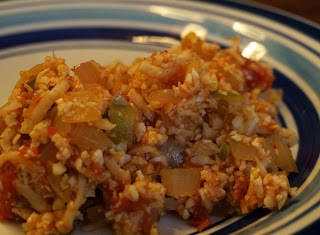 This is a basic and very tasty variation of cauliflower rice. We had this tonight with lettuce leaf tacos and it was wonderful! Melt the cooking fat in a large skillet and saute the onions for several minutes until they begin to soften. Add the peppers, the garlic, and the spices. Stir thoroughly and allow to cook until softened. Add the canned tomato (I used tomatoes frozen from my garden last year). Because the cauliflower doesn't absorb liquid the way rice does, I would recommend using 2 cups of tomatoes but not using much of the liquid. Reserve the liquid for use if the mixture is too dry. You can use broth instead for that purpose if you prefer. Add the cauliflower and continue to cook on medium-high to high heat, stirring frequently. Cook until the cauliflower has reached desired softness, about 5-10 minutes. If the cauliflower isn't softening well, you can add some liquid and cover it for a few minutes. Put in a bowl and garnish with green olives if desired. I have been making cake/bread out of coconut flour recently in order to make it low oxalate (the nut butter bread is high oxalate). I added some blueberries to the batter to "liven it up", which does raise the oxalate content a bit, but not too much. This was so delicious! This would make a wonderful brunch for non-GAPS guests. To make the batter, follow the recipe for Teri's Almond Cupcakes. Substitute vanilla for the almond extract and add 1 or 2 handfuls of blueberries, depending on preference. Bake in an 8 x 8 inch Pyrex dish (or in two loaf pans filled only halfway up). The cooking time will be at least 10 minutes longer. 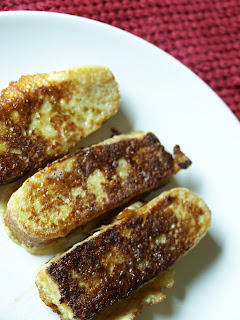 To make the french toast, slice the bread into 3/4 inch thick slices. If you used a square Pyrex dish, cut it into two 4 x 8 halves first, then cut each half into slices so the slices aren't too long to work with. Soak in a mixture of 2 eggs with a little coconut milk, kefir, or yogurt, and vanilla extract. Fry the slices in butter on both sides until golden brown. Serve warm with jam, honey, or fresh fruit on top.